If you create, consume or manage online learning materials on a learning management system (LMS); have you considered how a chatbot or a voice first service could be used to supplement or enhance the library of learning materials that is stored on your LMS? In this short article, I would like to explore how a school, college or university could start to leverage the capabilities of a chatbot to support distributed learning. At a simple level, a course team may utilise a chatbot to answer the myriad of questions that students ask at the start of their course; such as, what units are being taught on the course, who are the tutors on the course, what are they teaching or how am I going to be assessed? Once a student embarks on a new unit, the questions may focus on specific themes or topics that are covered in the unit; questions may relate to the terminology used during the course of the unit or the student may seek guidance on how to do referencing for a forthcoming assignment. The anatomy of the chatbot means that teachers can view the questions that are being asked and more importantly they can identify the students who are asking these questions. Teachers can use this information to inform the delivery of the course and the support that is offered to each student. Traditionally, online assessment practices were seen as being rather narrow; and online instructional designers could only offer teachers a limited set of options which typically meant the use of multiple-choice questions or drag-and-drop activities. However, the conversational capabilities of a chatbot can be used to enhance the way students are assessed on a course. They provide teachers the opportunity to ask open ended questions that require the student to answer in longer form. For example, a teacher may ask her students to respond to the following question in an online tutorial: "Could you tell me why good customer service is important to businesses and other organisations?" The following video from Bolton College shows how an online conversational tutorial handles such a question. The ability to record, analyse and assess a wide range of possible responses to such a question is a key attribute of conversational tutorials. The teacher can also pose follow-up questions to garner further insight from the student and she can offer feedback that is tailoured to suit the needs of the student. When a conversational service is coupled with learning analytics the questions, the follow-up questions and the feedback that is presented to each student offers further personalisation. In the above example, the dialogue between student and the chatbot is via text; however, a voice first chatbot can also enable dialogue using speech. The use of a chatbot now provides teachers the opportunity to use an online assessment method which closely mirrors the assessment practices of a face-to-face classroom environment. A typical learning management system could have tens of thousands of documents in its library. This number could be many times larger if we take into account the archived content on the LMS. The volume of content grows further still if we include image and video libraries that are held by the school, college or university. The natural language processing and natural language understanding capabilities of your chatbot could be used to enable semantic search on your LMS. For example, a student could search for a transcript of a lecture that was given by a member of the course team by asking the chatbot the following question: "Can you find me the lesson where Tom Jones talked about contract law?" The chatbot could offer the student the link to the transcript, the files associated with the lesson or even the video where Tom Jones referenced contract law. Institutions can also leverage learning analytics and their business intelligence tools to inform the behaviour of the campus chatbot on the LMS through the use of natural language generation and intelligent process automation. For example, if a student is seen to be struggling with any part of the course the chatbot could offer the student the opportunity to meet up with the subject teacher. 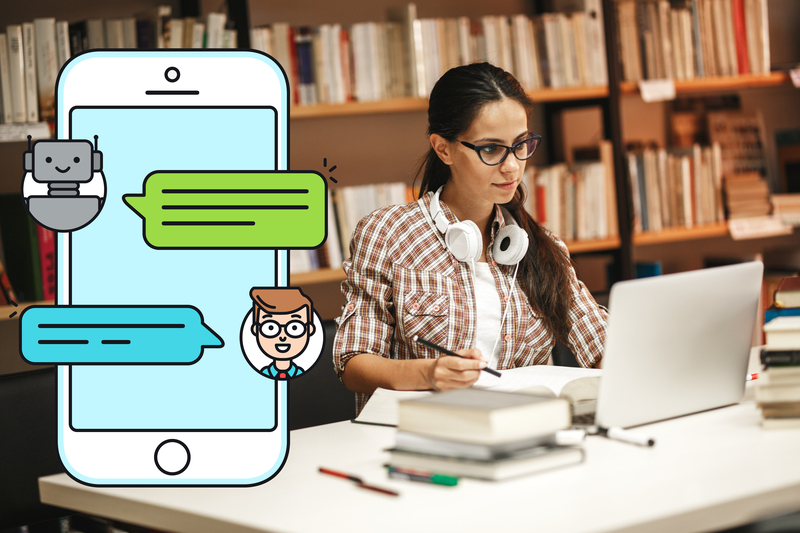 The chatbot could offer library resources to support a student when he or she starts a particular element of the course; even reserving a textbook on behalf of the student. Chatbots can also be used to remind students about key milestones during their course such as assignment hand-in dates, appointments with course and support teams, events around the campus or the deadline for applying for university. The chatbot service can also take advantage of other delivery channels such as text messaging students. A mature chatbot service will also behave contextually when offering information, advice and guidance to students. If your campus uses a cloud based LMS the vendor may offer a chatbot that can support enquiries about data that is held on the LMS. However, students will also want to use the chatbot to ask about information or events that are not stored on the LMS. What is your strategy for coping for this? Some LMS vendors may offer a voice first service. Voice first services take advantage of smart speakers such as Amazon Alexa, Apple HomePod, Google Home, Microsoft Cortana or Samsung Bixby. Since most of these devices come without a screen, how will your institution use these services to support students with LMS enquiries; especially when the content on your LMS is media rich? In Bolton College's case we have decided to couple voice, text and screen. When you use your voice to ask the Ada iOS app a question the service responds using speech, text and rich multimedia. For short answers voice output is sufficient. For other questions a student may seek out more detailed responses from the chatbot; which may include images, videos, tutorials or links to other subject matter. At Bolton College our strategy for the Ada service is to develop a general purpose campus chatbot by building multiple APIs which will enable the chatbot to communicate with multiple datasets around the campus. Some institutions may wish to use best of breed chatbots which are finely trained to support a narrow set of questions and platform tasks. If this is the case, will you want these discrete chatbots to communicate and cooperate with each other? Offer your students the opportunity to access the LMS chatbot over multiple delivery channels; such as the web, native apps or via smart watches and speakers. At Bolton College we are regularly asked about the platform that we have used to develop the Ada chatbot. The name of the platform is IBM Watson. The platform has proven to be very affordable, reliable and versatile.